English translation: Thank you for all your comments! It is great to receive direct response and it's fun. I am grateful to everyone. Have a great weekend. Today I tried to upload this photo without putting any translation. 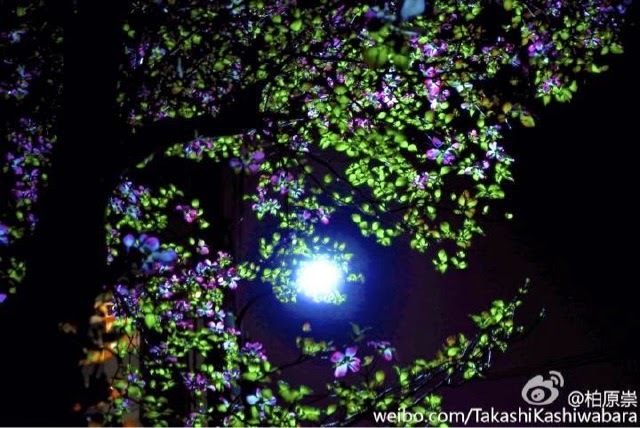 This picture was taken at night on the street. A warm night send from Tokyo. Kassy is really enjoying himself as a photographer. It seems like Takashi Kashiwabara is taking things slow. He appears to be in the state of semi retire from the Entertainment industry. These days, Kassy is more interested in finding his own hobbies or interest. Rather than competing with young actors out there, Kassy seem to be weary of the competition. It could be that the amount of work he received have been lesser than before. Anyway, it is a smart move on his part to open the market in China. Fans from all over the world can connect with him through Weibo and he can share his life with his fans. He will not be forgotten by his loyal fans no matter how time flies. 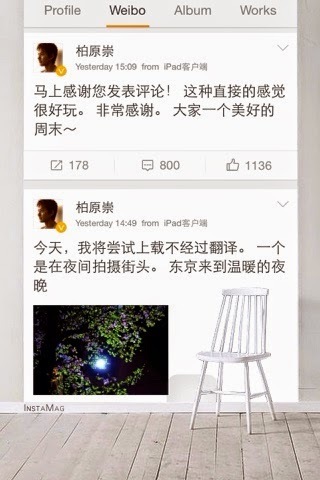 Recently, it was observed that he begin to update his Weibo at least once a month. It shows that he did make an effort to use the social media as a means to reach out to his fans. I like the masterpiece that he posted online. It shows an artistic and talented side of him.